Week 24 of 100WC: 2 Mil Lel Students Showcased! Whoa! Not one, but two Mil Lel students showcased for week 24! 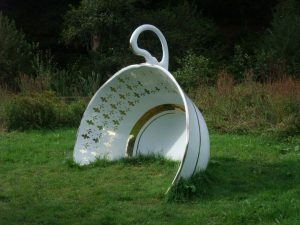 That week the prompt was that of a giant teacup, half-buried in the ground. Do you agree with her? Visit Zac’s blog to read his unusual response to the prompt. Zac’s writing partners were Jorja M, Ava, Elwood, Dean and Rachel. “I heard the sound of the teacups rattling on the table – that was just before the scream of the people in the street started…” this is an extract from Shaunn’s story. Mrs McKenzie from New Zealand congratulated Shaunn on crafting his writing for maximum impact… read the rest of his story here. Shaunn’s writing partners were Alex, Izzy, Jocelyn, Charlotte and Charlie. To read all the stories that were showcased that week, head here.